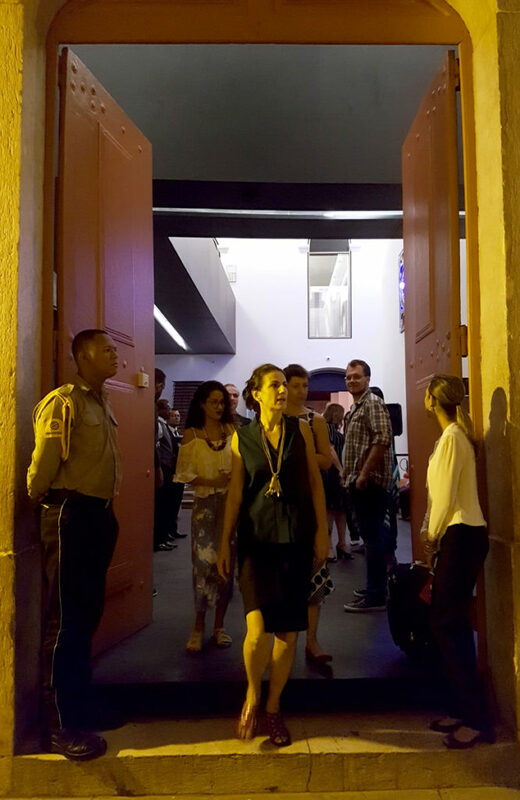 FILE SÃO LUÍS 2017 – Centro Cultural Vale Maranhão – Organizadora do FILE Festival: Paula Perissinotto. Opening hours: April 5th to June 4th, 2017. Tuesday to Sunday – From 10 am to 7 pm. FILE, for the first time in the northeast of Brazil. In the exhibition “FILE Sao Luis 2017” we present for the first time in the Northeast of Brazil a cut from FILE – Electronic Language International Festival, with virtual reality works using 3D glasses, interactive and non-interactive installations, games and animations. The coming of FILE to Sao Luis indicates the tendency of the close connection of the art with the recent technological developments. Art has always been the result of the application of techniques in the development of poetics. Now, increasingly, recent digital technologies are being applied by the artists in the creation of different experiments, hence the importance of showing what has been accomplished by the creators who deal with this interrelationship in different regions of Brazil and the world. For 18 year, FILE promotes exhibitions, workshops and meetings whose objective is to foster the debate on the interrelationship between art and technology. With annual events in Sao Paulo, exhibitions in Rio de Janeiro, Belo Horizonte, Curitiba and Porto Alegre, as well as the participation in international events, the festival is the biggest event of electronic art in Latin America. In this edition in Sao Luís, the public has the opportunity to live different experiences in our world or in other fictional worlds through total immersion in virtual reality with the use of 3D glasses. In “Be Boy Be Girl”, by Frederik Duerinck & Marleine van der Werf, we are invited to visit a beach in Hawaii, choosing to be in the body of a man or a woman. In “The Night Cafe”, by Mac Cauley, it is possible to explore the world of the paintings by Van Gogh and even meeting the painter himself in an animated version. In “Swing”, by Christin Marczinzik & Thi Binh Minh Nguyen, the dream of flying becomes reality. Sitting on a swing, the bigger the movement applied by the visitor, the brighter the colors of the world experienced. In addition to the experiences in virtual reality, the dialog between the physical world and the digital world is possible through different interfaces, which involve the interaction of the visitor through word and body. The works of the Brazilians Rejane Cantoni and Leonardo Crescenti “Fala” (Speak), “Túnel” (Tunnel) and “Piso” (Floor) are machines that respond to actions like speaking and walking on a floor or a tunnel. In the work “Piso”, a wave that goes back and forth can be felt by others who walk, sit or lie on the installation. In “Starry Night”, by Petros Vrellis, it is possible to change the iconic flows of an animated version of the work “Starry Night”, by Van Gogh, by touching the screen. In a non-interactive line, “Vídeo-Boleba”, by Celina Portella, shows the passage from the digital world to the physical through the game of marbles, that leave the plane of the screen and spread through the gallery’s space. In turn, “Hardwired”, by Marcel Van Brakel & Frederik Duerinck, consists of about 18,000 LED lights in a physical network, which symbolizes the transfer of knowledge that occurs in the synaptic networks of our brain. The acquaintance with different experiences in our world or in other fictional worlds is also possible in the selection of electronic games and animations. Yet among the installations, in “Journey”, by That Game Company, it is possible to walk through dunes and ancient ruins. The objective is to reach the top of the mountain, but the experience involves the discovery of who you are and what your purpose is. In addition to the installations, FILE Anima+Games gathers animations and games in the same event, with the intention of highlighting aspects that would go unnoticed if shown in its own logic. On the one hand, the animations with their own creation and production strategies, with its already known influence by the cinema, and on the other, the games, with the notorious problematic between narratology and ludology, but also among the games and the metagame. This is an unprecedented visit of FILE to the Northeast of Brazil. Don’t let the wave slip away!